BelarusDigest > All > Will the Belarusian Authorities Learn from the Ukrainian Crisis? The conflict in Eastern Ukraine has brought some benefits to the Belarusian authorities. Due to the instability outside Belarus, Lukashenka's position in his dealings with the West has been strengthened. His recent phone conversation with Polish Prime Minister Donald Tusk proves this point. Belarus plans to capitalise on its role as an intermediary in certain sectors of Ukrainian-Russian relations. Meanwhile Lukashenka's approval rating has hit 39.8%, the highest it has been in some time. However, long-term losses exceed the potential benefits. Lukashenka can no longer predict the actions of Putin, who despite expecting further sanctions presses on, a point that Belarus has yet to concede. The long-term slowdown of the Russian and Ukrainian economies will greatly damage Belarus. If the conflict deepens, Belarus will lose even more. Therefore, Lukashenka's regime must reform the country and begin to gradually increase cooperation with the West. The European Union must recognise the limits of cooperation with the Belarusian authorities, but also be ready to consider a bailout for Belarus. According to the Independent Institute of Socio-Economic and Political Studies, Lukashenka's approval rating over the last three months has increased by 5% and his trust rating exceeded his distrust rating. 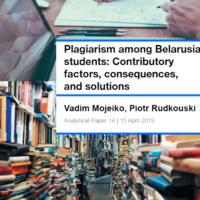 On the background of the events in Ukraine, the Belarusian state leader appears to be a stable and effective leader, while relatively portraying Belarus' slowing economy as not particularly threatening to the nation. Moreover, Lukashenka’s popularity extends not only to Belarus. During an interview on Ukrainian TV, 100% of the audience voted in agreement with the Belarusian head of state on some of the statements he made. The West is also beginning to look at the Lukashenka's regime differently. In April, the first time after the 2010 elections, Polish Prime Minister Donald Tusk talked with the Belarusian ruler for a few hours. Over the last month, Deputy Foreign Minister Alena Kupchyna held consultations in Slovakia and Germany. On 28-29 April, she also participated in the meeting of foreign ministers of the Visegrád Group and of the Eastern Partnership, where Kupchyna had a bilateral meeting with Štepfan Füle. 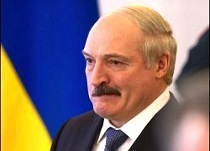 At the moment Lukashenka looks better than the weak Ukrainian authorities or imperialist Putin. At least insofar as the Belarusian authorities are causing fewer problems for the rest of the world. If the conflict between Ukraine and Russia deepens, Belarus can lay claim to being an intermediary in the economic relations of the countries. Belarus played this role for Russia and Georgia for a while, but on a small scale. Belarusian Airlines flights between Minsk and Tbilisi are always full of Georgians going to and from Russia, particularly when there were no direct flights between Moscow and Tbilisi. Belarus has already declared its readiness to develop military-industrial cooperation with both countries to find contacts (and contracts) from both sides. It seems that Russia and Ukraine will continue to sell weapons to each other, but through an intermediary Belarus. Although Lukashenka’s regime has already won something from the conflict in Eastern Ukraine, the future costs for Belarus may be substantial. First of all, the Belarusian authorities have lost confidence. For many years, Minsk looked at Moscow as a cash cow – a sometimes tough partner, but not an aggressive one. Now Lukashenka does not know what to expect from Putin. The Kremlin’s possible military intervention in Belarus has become one of the scenarios that the authorities and the opposition are becoming increasingly aware of. On 22 April, Lukashenka even demanded that law-enforcement agencies “immediately eradicate any speculation about the violations of Russians’ rights in Belarus”. Any growth in Russian imperialist fervour will only further subordinate Belarus to their eastern neighbour. Many hoped that Putin would abolish duties on Belarusian oil to maintain the loyalty of Minsk. However, it seems that the Kremlin has chosen the path of sanctioning Lukashenka’s regime rather than make concessions to him. On 22 April, Alexander Lukashenka said he would not sign a landmark agreement on the Eurasian Economic Union if Russia leaves keeps its restrictions on the oil and gas market. However, only a week later, Lukashenka, Putin and Nazarbayev agreed to sign the treaty, although Russia will liberalise these markets only in 2025. The Belarusian economy in long-term will lose much as a result of the conflict. The International environment was unfavourable for Belarus even before the conflict. Now the deteriorating economies of its largest trading partners will push Belarus into a recession. Foreign exchange reserves decrease monthly, and the authorities need to take steps such as privatisation or devaluation to simply stay afloat. Where is Belarus’ Place in the New Cold War? The Belarusian authorities, although they garnered some benefits from the conflict, crave the stabilisation of Ukraine. Moreover, they have become very weary of a new Cold War. If a new Cold War is launched, Lukashenka's regime will no longer be able to continue his long observed balancing act policy between the East and the West. Putin's refusal to abolish duties on key goods that boast the Belarusian economy shows that the Kremlin's strategy towards Belarus may yet become even more severe. Russia in such circumstances seems like a natural choice, as Belarus militarily, energetically, economically and even culturally deeply dependent on it. If Belarus chooses the West, Russia may send more troops into Belarus. Therefore Lukashenka’s regime should take real action, release political prisoners and start economic reforms. On 22 April, Lukashenka said that Belarusian nation should stay united and said that if "we lose our language, we will disappear". This was quite a step for a pro-Soviet ruler who claimed in 1994 that the "Belarusian language is an impoverished one". National identity remains one of the most important elements of the nation's overall system of self-defence. It alone can act against the massive currents of Russian propaganda to which Belarusians are exposed to through popular Russian TV channels daily. It is precisely for this reason that Lukashenka should implement his words into practise. ​​​Belarus' relations with the European Union must be based on mutual trust between both parties, not just a goal of irritating Russia. Modernisation projects can be a good start. The West must be aware of the limitations of Belarus, but also be prepared to confront Russia in case of regime change or increased pressure. Unfortunately, independent and democratic Belarusian government as a result of a regime change hardly looks realistic after what Russian is doing in Ukraine. The European Union and the United States should strengthen their positions inside Belarus and help stabilise the Belarusian economy in case of a severe crisis. However, the Ukrainian crisis should serve as a wake up call for everyone in Belarus. Belarus as a country has a difficult task ahead of it in trying to learn some lessons from Ukraine and react to growing threats to its future. Alexander Lukashenka's annual address to the Belarusian people and parliament was the number one news item of the past week. The head of Belarus, Russia and Kazakhstan met in Minsk to discuss Eurasian integration. Meanwhile, Ukraine's acting president, Oleksandr Turchynov, reported to the Belarusian leader developments in the eastern part of the country. Corruption in Belarus remains a problem, but not as serious as in Ukraine or in the West, one state TV journalist points out. Eurasian Integration – A Meeting of Member States in Minsk – Belarusian State TV reported that the meeting was one of the most important events of the week. The Belarusian leader stressed that the removal of exemptions in inter-state trade was a must to truly integrate the member countries. The respective heads of states also discussed the enlargement of the Customs Union. Lukashenka advocated for not creating any additional incentives and privileges for new member candidates. The creation of a common energy market remains a controversial issue for the parties, state TV noted. In their coverage, they reported that they it is expected that no later than 2025 there will be a common market for oil, oil byproducts and natural gas. Eurosceptics in the Western Europe are Getting More Powerful – A state TV journalist commented on recent polls that suggest there is an increase in the popularity of the eurosceptic UK Independence Party and Labour Party supporters. Similar trends are noticeably springing up in France and Netherlands as well. According to [unnamed] experts, the French ‘National Front’ and Dutch ‘Party of Freedom’ may obtain up to 38 seats in the upcoming elections for the European Parliament. If they are able to reach an agreement with the British 'UKIP', and thus create a coalition of eurosceptic parties, it would have certainly an impact on the EP. Facilitated Visa Regime for Moldovians, but… – The European Union has facilitated visa-free regime with Moldova. However, as a report on state TV emphasised, there are some limitations – Moldovans will not have the right to travel freely to the United Kingdom or Ireland. So far over 100 people have already travelled on the new visa-free regime. Budapest: Visegrad Countries and the Eastern Partnership – The ministers for foreign affairs from the Visegrad Group countries met with officials representing the Eastern Partnership states. Elena Kupchyna, deputy minister of foreign affairs, in Budapest presented the official position of Minsk. According to her, the Eastern Partnership initiative requires some serious reconsideration. Other participants agreed with her, the report pointed out. Kupchyna also added that equality and a non-discriminatory policy for participation for all countries should become the main principles of the project. 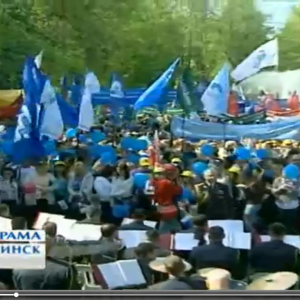 1st of May: Workers Solidarity Day – The annual holiday brings together different generations, according to state TV. Leanid Kozik, a leader from the official (government supported) trade unions, emphasised that the unions are concerned with human rights and have been paying attention to them. That includes ensuring individuals' right to work, fighting against unlawful dismissals from work and the right for children of an employee to study, he explained further. Annual Address to the Belarusian Nation and Parliament – State TV described it as "the event of the day for the state and our neighbours". Lukashenka spoke to the Belarusian parliament for 4 hours. Albeit the tradition of having an annual address of a head of state to the nation existing in many other countries, only in Belarus does it truly address the people, according to the reporting state TV journalist. "A strong economy and honest authorities should be a foundation of sovereignty of the state and flourishing of the nation", noted a journalist, repeating the words of Lukashenka. Further they reported that throughout his speech the Belarusian leader cited the Bible and called for maintaining the integrity and independence of the country. "We accept any opposition which operates in accordance with the law", Lukashenka stated. The authorities are ready to implement progressive reforms, however, "any signs of radicalism in Belarus will be crushed at an embryonic stage". Belarusians Praised Lukashenka’s Address to the Parliament – One state TV journalist struck out to find out the reactions of both experts and ordinary Belarusians to Lukashenka’s address in Parliament. The assembled footage presented the opinion of students, doctors, pensioners, political scientists and even Internet users – all of which unanimously praised the Belarusian leader’s address. Lukashenka-Turchynov talks – State TV reported that both leaders had a phone conversation regarding the current developments in Ukraine. The acting president of Ukraine updated the Belarusian head of state on the situation in the country. In particular, he reported developments in the city of Slaviansk. "An anti-terrorist operation is being carried out there. Five terrorists, who opened fire on the armed forces of Ukraine, have been killed", the report stated. Head of State Meets with Ordinary Belarusians – Lukashenka went to the city of Klimavichy in the Homel region, which was contaminated as a result of the Chernobyl nuclear power plant accident. State TV coverage stated that just after his talk in Belarusian parliament, the head of state immediately set out and met with ordinary people to answer their questions "as open as always and without censorship". When meeting with people, Lukashenka discussed the developments in Ukraine and expressed his concerns for ordinary Ukrainians. He also criticised over re-writing history. "They are trying to deprive us of what makes us significant, improves our image, (they) deprive us of our history", he noted referring to any attempts of diminishing the importance of the Great Patriotic War. At the end of the report, locals thanked Lukashenka for his visit. ‘Pozicija’ (Position) Talk Show: Corruption in Belarus – Among the shows participants were officials, a state-run newspaper journalist and a businessman. In the short introductory feature about corruption, the reporter stated that the problem was not nearly as dire as in neighbouring countries. The audience could choose, via text message, whether those who offer bribes or those who accept them are guilty. In the end it became clear that 78% of voters put blame of those who accept bribes. According to one of the participants, the gradual privatisation of state enterprises could solve the problem. In his opinion, the privatisation of education and health care system would lead to gains in the quality of their services, but also a decline in corruption. Participants from the talk show also discussed corruption in Ukraine and in the European Union. Additionally, they analysed if a particular political system facilitates corruption in a country. In liberal democracies it is hard to react quickly to problem, though in authoritarian countries a leader can react swiftly, one of the participants noted.